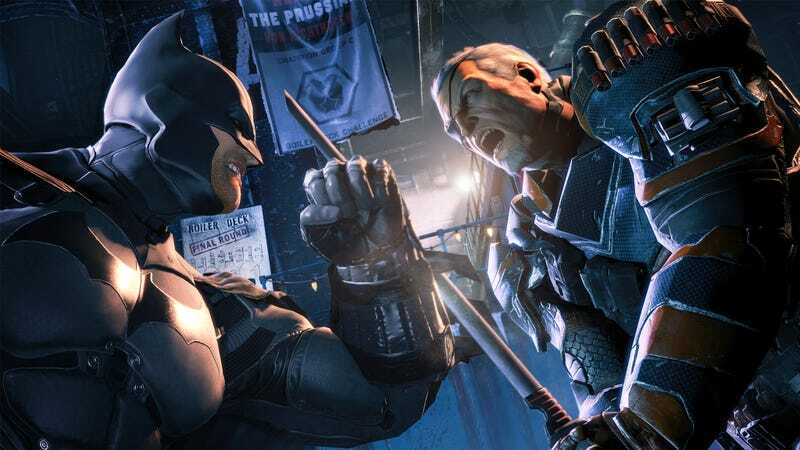 The folks making Batman: Arkham Origins know exactly what they're trying to accomplish with this year's Dark Knight video game. It's the story of the night where Gotham City's supervillain culture spins irrevocably out of control. This is when the Dark Knight becomes a legend, they say. So, it's really too bad that the new Bat-voice isn't working for me. I've seen Batman: Arkham Origins twice in the last three weeks, first at PAX Prime in Seattle and then again at a demo in New York City last week where I got to play it. And when I watched that demo at PAX, the first thing that struck me was how different this Batman sounded. Of course, I knew it was coming. Still, I was shocked when really getting to hear Roger Craig Smith's rendition of Batman for the first time. Smith's Bat-voice is very gruff. Honestly, it's a little too growly for me—no, not as bad as Christian Bale's, and I say that as someone who likes Bale's Bat-voice—but, hey, Kevin Conroy's smoother vocal performances were a revelation to me all those years ago. If I had to hazard a guess, I think hearing Smith's portrayal of Batman will feel normal after a few hours of playing. It's not a deal-breaker. Nevertheless, the change in voice actor is a smaller element in a bigger quirk about Arkham Origins. When it comes to the circumstances of its development, this entry might be the most comic-book-like game in the series. In superhero comics, especially those belonging to long-lived characters like Batman, talent never sticks around. The storytelling torch always gets passed along. Batman comics didn't stop when writers or artists like Frank Miller, Greg Rucka, Don Newton or Norm Breyfogle moved on. And so it is with the character's video games. Rocksteady Games, to much acclaim, made Arkham Asylum and Arkham City and now it falls to the Warner Bros. Montreal studio to follow up those two very good games. They've gone the prequel route—crafting a Christmas Eve story where eight super-killers are trying to murder Batman to collect a bounty put out by underworld kingpin Black Mask—but also have to add new ingredients to a well-loved formula. So what's different? For one thing, the open-world Gotham in Origins is denser than in City. Buildings have more levels to them. So, when you aim a grapple reticule at a structure, you don't have to automatically zip to the top. That density applies to nearly every aspect of the game that I've been shown so far. Origins layers a few different mission types across the main storyline. Take The Most Wanted missions, for example. They focus on super-criminals other than the eight assassins trying to collect the bounty on Batman's head. One such mission featured radical political vigilante Anarky, who's planted bombs all over the city that Batman must track down. "Honestly, it's a little too growly for me—no, not as bad as Christian Bale's, and I say that as someone who likes Bale's Bat-voice..."
During these side quests, you'll face some new enemy types like the Armored Enforcer, whose protective plating needs to be torn off before you can hurt him. The game's creative director Eric Holmes showed me the game at PAX and said that players will now get different levels of XP for taking out enemies like these. He also remarked that they'll get more feedback about how they're playing after combat encounters. Most Wanted quests will grant special rewards but they're optional. Holmes told me that it's entirely possible to finish the game without facing certain characters. It's a move that's aiming to allow for more player agency as far as how one experiences the game. Because Origins happens two years into Batman's early career, he doesn't have the trust of Gotham's cops. So, the Crime in Progress quests consist of missions where Batman does things like rescuing police officers pinned down in a shootout; completing these side quests will help gain the respect of the GCPD. And because it's Gotham, corrupt cops will be part of the challenges players face, too. One of the game's subplots involves dirty SWAT commander Branden, who's using GCPD manpower to try and kill Batman so that he can collect the bounty before any costumed bad guys do. Then, in a sequence leading up to a boss encounter with airborne pyromaniac Firefly, the cops responding to a crisis where the Pioneer Bridge is being held hostage want to take Batman down, too. This chunk of gameplay let me see Batman's shock gloves in action, as he fought through waves of enemies to track down Firefly. The electrified gauntlets can punch through enemy armor for quicker combat cycles and can also be used to power up lock mechanisms and the like to solve environmental puzzles. Yup, just like the other gadgets in the ol' utility belt. When Batman finally reached the outside of the bridge, Firefly taunted him with a barrage of villain chatter. Holmes ended the demo there, though, leaving the showdown as mystery for the time being. But I actually got to play one of the game's boss fights when I saw Origins again last week. The big bad in question was Deathstroke, arguably the deadliest man in the DC Universe and the character prominently featured in the debut trailer for Origins a few months back. This time, the demo was chaperoned by senior director Ben Mattes and gameplay director Michael McIntyre. The level I played started with Batman infiltrating a cargo ship/cruise liner hybrid called The Final Offer, which serves as the Penguin's mobile base for gun-running and other perfidy. Since Oswald Cobblepot is also an information broker, Batman's plan is to interrogate the waddling crimelord to get information about Black Mask, kingpin who's put a substantial bounty on his cowled head. The part leading up to the Deathstroke encounter began with the kind of shadow-skulking that will be familiar to people who've played previous Bat-Arkham games. One wrinkle was a moment where a thug took a hostage, which is a mechanic previously seen in the Harley Quinn's Revenge DLC from Arkham City. If you save the hostage while clearing the area, you'll reap more XP and a better Dark Knight rating for doing so. When Batman finally reaches the Penguin's office, the bird-obsessed criminal is torturing a son of the Falcone (or was it Maroni) crime family. It's a moment that presages the shift in power from mobster to super-crook. One quick Bat-slap later and all that messy torture stops. Penguin's thugs pour into the room for more combat but Deathstroke interrupts with a cocky boast about how he's going to defeat Batman. "Overall, the showdown with Deathstroke was a cool-looking martial arts showdown that felt more acrobatic and more athletic than the ones I remembered from previous Arkham games." He almost did it, too. It took me about six tries to finally beat Deathstroke into submission. Part of it was the rustiness of my Batman video game reflexes. But the design of the encounter was the other reason. This boss fight is essentially a seven-layer counter cake, presented as brawl with an opponent that's stronger and faster than Batman. After getting some hits in with the usual strike/counter/evade inputs, the battle goes into a few very rapid quick-time sequence. These get more intricate as the fight goes on with two, three counters becoming necessary to create the openings where Batman pounds away at Deathstroke's life bar. In between that pattern is another one where Deathstroke will leap away and launch explosives at Batman, which then need to be deflected back at the one-eyed assassin. And if you let him get too much distance, he'll pull out his sidearm and fire shots at Batman. While that's nothing that a quick yank with Bat-grapple can't solve, it's another example of the density that Arkham Origins is bringing to bear on the Bat-game formula. Where I first found myself obsessing on input prompts, I finally wound up taking out Deathstroke by improving a bit and creating interrupts during his attacks with dodges and grapple-yanks. It wasn't exactly the way that the fight was supposed to be played but I was heartened that such a tightly-patterned boss fight allowed for a bit of personal style to win the day. Overall, the showdown with Deathstroke was a cool-looking martial arts showdown that felt more acrobatic and more athletic than the ones I remembered from previous Arkham games. Exactly the kind of thing that soothes fears about the franchise being handled by a different team. Each time I've seen Arkham Origins, the game-makers I've met with have been coy about plot points. At PAX three weeks ago, a scene played out where a Bane-bruised Batman was shoved into a room with the Joker. Annoyed that he wasn't getting cut into the Christmas Eve fun, Joker explained that he'd planted explosives in buildings all over Gotham. (And, if you're wondering, Troy Baker sounds great as the Clown Prince of Crime.) When I asked Holmes if this was the first time that Batman meets his archenemy in the Arkhamverse continuity, he said that he couldn't answer that. But he could say that said scene was in the game. Two weeks later, I noticed that Batman showed some familiarity with Deathstroke in the cutscene before their fight, referring to him by his first name. Did the characters have some history in the game's universe? Mattes and McIntyre begged off of answering, saying that they couldn't say one way or another whether Batman had prior knowledge of Slade Wilson's murderous alter ego. Even more important to a recovering continuity nerd like me: what's the deal with the game's new video-scrubbing investigation sequences? If this game's a prequel, how come this fancy Wayne Industries tech doesn't show up in Arkham Asylum or Arkham City? "How do you know it isn't?" Holmes answered with a smirk. He went on to explain how Batman simply made not have encountered crimes scenes where he needed to use the tech in those games. Or maybe he had just become a better detective by that point. Non-revelations aside, I feel mostly positive about Batman: Arkham Origins. It's clearly not going to be a quantum leap for the current Batman video game template. But it seems set to squeeze more texture and more lore into Bruce Wayne's digital life story. We'll see how it all pans out when the game hits shelves later this fall.